See details of two books on the Great War history of this battalion here. The regiment that would later be known as the 16th Regiment of Foot was raised at Reading in October 1688, and was in action months later at the Battle of Walcourt. During the Marlborough campaigns they distinguished themselves as steady, reliable fighting troops and by the end of the campaign had won five battle honours. A more detailed history of the battalion's service between 1688 and 2009 can be seen here. The regiment was engaged in numerous of the Empire's wars throughout the 18th century and between wars, campaigns and spells on home soil, they served in many countries including Canada, North America, India, South Africa, the Far East, the West Indies and Ireland. They were not involved in the Peninsular Wars against Napoleon's armies, as they were stationed in the West Indies at the time. On returning home in 1814 had to be rebuilt as they had been employed on garrison duty in the 'fever isles' for ten years and were literally a mere skeleton of their former selves. Although the regiment was in Canada when Napoleon marched north out of France in 1815, they were ordered back to Europe, but by the time their ship arrived and transported them to Europe, it was all over. This episode is reputed to have led to their nickname 'the Peacemakers' and regular quarrels with the 30th Foot ensued during garrison postings, as a result of the 30th's taunts and the 16th's irritability at having missed the entire campaign against Napoleon. With that, the 16th Foot were once again destined for a long spell patrolling the Empire. Service in Ceylon (to 1828) and Bengal, followed by tours in Gibraltar (to 1847) and Corfu were all uneventful. In 1851 Jamaica beckoned again, followed by another posting to Canada. Ireland followed as a second battalion were raised (to become the 2nd Battalion, the Bedfordshire Regiment when the County affiliation was introduced in 1881) and the Crimean War came and went without either battalion being available to the British forces at the time. Despite their growing annoyance and being unable to shake the 'Peacemaker' label, the 16th Foot were commended on their behaviour at every station of their garrison service and known to be remarkably disciplined, highly trained and always eager. By the 1890's the 1st Battalion were in India and took part in the Chitral Expeditions against several revolting tribes, the most notable action being at the Malakand Pass between the 2nd and 4th April 1895. They forced the pass despite dreadful terrain and chased the retiring enemy army some four miles on the first day, eventually causing them 500 casualties which was no mean feat given the type of fighting. The Chitral battle honour was 'well deserved' for their involvement and adorns the regimental standard to this day. After Chitral, the 1st Battalion were back patrolling the Empire and had no involvement in the South African Wars of 1899 to 1902 as a battalion, although the 2nd Battalion did, and took drafts of Militia, Reserve and minor 1st Battalion contingents. Until the outbreak of hostilities in Europe in the summer of 1914, the 1st Battalion served in India and Ireland on relatively peaceful policing duties. "It is my Royal and Imperial Command that you concentrate your energies, for the immediate present upon one single purpose, and that is that you address all your skill and all the valour of my soldiers to exterminate first the treacherous English; walk over General French's contemptible little Army." No documentary evidence appears to have survived verifying the Kaiser's order so whether the phrase was the result of propaganda or not is open to debate. Their division landed in France on 16th August 1914 as a part of Haig's II Corps and fought in the early engagements of the war. They were engaged at the Battle of Mons in August and fought during the stand at Le Cateau, where five Victoria Crosses were won by their division. After service during the battles of the Marne and the Aisne, they were rushed north to Flanders and were also involved in the Battle of La Bassee, followed by the First Battle of Ypres. By the end of November the division had suffered 5,000 casualties and stayed in a purely defensive role that winter. Having moved to the Ypres salient early in 1915, the division were engaged at the Second Battle of Ypres, defending Hill 60, where another four Victoria Crosses were won in one day. In May Private Edward Warner of the 1st Bedfordshires won the Victoria Cross defending Hill 60 during the early use of gas as an offensive weapon, but was awarded the honour posthumously as he died of his wounds the following day. After spells holding new portions of the Western Front taken over from the French on the Somme and at Arras, the battalion were heavily engaged during the Battles of the Somme 1916, at Arras and the Third Battle of Ypres in 1917, before moving to the Italian Front in December 1917. Their division was rushed back to France in April 1918 in response to the German Spring Offensives and remained on the Western Front until the end of hostilities in November. 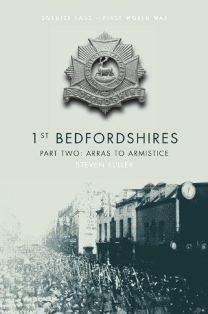 1st Battalion, the Bedfordshire Regiment. 1st Battalion, the Norfolk Regiment. 1st Battalion, the Cheshire Regiment. 1st Battalion, the Dorset Regiment (Between August 1914 and December 1915). 1st/6th Battalion, the Cheshire Regiment (Between December 1914 and March 1915). 1st/6th Battalion, the King's (Liverpool) Regiment ([Between February and November 1915). 16th Battalion, the Royal Warwickshire Regiment (Between December 1915 and October 1918). In 1915 they were heavily engaged during the Battle of Ypres 1915 (also known as the Second Battle of Ypres) in April and May, where they fought at Hill 60 during the initial capture and subsequent defence that saw them lose so heavily that they were effectively rebuilt twice during the fighting. In 1916 they were involved in several phases of the Battle of the Somme, namely the attacks on High Wood 20th to 25th July, at Longueval 27th to 30th July, the Battle of Guillemont (specifically the capture of Falfemont Farm 3rd to 6th September) and the Battle of Flers-Courcelette (specifically the Battle of Morval on 25th September). In 1917 they were at the Battle of Arras, specifically at the attack on La Coulotte in April and the Third Battle of the Scarpe in May. They were also involved in the capture of Oppy Wood in June. During the Battles of Ypres 1917 (known as the Third Battle of Ypres or Passchendaele), the battalion were engaged in the Battles of Broodseinde and Poelcapelle in October as well as the Second battle of Passchendaele in October and November, before being moved to help stabilise the front in Italy following the disastrous battle of Caporetto. Commanding Officers of the 1st Battalion. Charles Richard Jebb GRIFFITH, C.M.G., D.S.O., between the 16th October 1913 and 3rd December 1915, at which time he went to command the 108th Brigade. Benjamin Robert ROCHE between 6th December 1915 and 1st February 1916, after which he returned to England to command Reserve battalions of the Middlesex and Worcestershire regiments. Cranley Charlton ONSLOW, C.B., C.M.G., C.B.E., D.S.O., from 1st February to 14th June 1916, when he went on to command the 57th Brigade. Noel Wilfred LAWDER from 14th June to 16th July 1916, who was killed in September that year. Walter ALLASON, D.S.O. & Bar, between 16th July and 3rd December 1916, when he was severely wounded by an accidental revolver discharge whilst in the trenches. Francis Noel BUTLER, between 18th December 1916 and 1st April 1917, when he went to command the 11th Essex. Percy Reginald WORRALL, C.B.E., D.S.O., M.C., from 1st April 1917 to 5th February 1918, when he went on to command the 1st Devons. Edward Ivan de Sausmarez THORPE, C.M.G., D.S.O., from 7th February to 16th April 1918, after which he served as the Brigadier General of the 152nd Brigade. Montague Walter HALFORD, M.C., from 16th April to 18th June 1918. Hugh COURTENAY, D.S.O., M.C., between 18th June and 23rd August 1918, when he died of his wounds after the assault against Achiet le Petit that day. William Stuart CHIRNSIDE, M.C. and Bar, from 23rd August to 14th October 1918. Charles Edward Gowran SHEARMAN , C.B.E., D.S.O., M.C., Legion of Honour, from the 14th October 1918 onwards.